When it’s an Indian wedding in conversation, remember – you cannot please everyone. Amongst the close family and friends, second and third removed cousins, distant relatives, friends of friends, building buddies, co-workers, co-workers from the old office and then some, there will always be someone who will either feel offended or just happen to miss out on making the cut to your guest list. Even though you have a mental list in your head of who gets invited to your wedding, wait until your parents come up with their lists. Here are some simple solutions to wedding guest list dilemmas that most Indian couples are bound to come across. My groom’s family is as huge as the cast of Hum Saath Saath Hain, but they aren’t paying for most of the wedding cost, my parents are – How do we split the guest list? The best and easy way out of this sticky situation is to split the wedding guest list in 3 parts –guests of the bride’s side, guests of the groom and guests of the couple. If the groom’s parents insist on adding more guests than the number of people they can invite to the wedding, a polite request stating they need to kick in some cash should be pronounced right away. If they don’t budge, the couple will then have to resort to opening up their big heart and downsizing their guest list. Do we have to invite all of our guests to our mehndi, sangeet, wedding ceremony and reception? No. It’s not that a big deal to invite people only to the reception and not the other functions. Indian weddings are expensive and the modern generation understands that. However, the oldies do tend to get a bit offended. So be wise on how you send out your invitations. Mark on your finalized guest list who will be invited only for the reception and not the ceremony or mehndi and sangeet. Be sure that your invites clearly mentions detail of only the events you want these guests to attend – aka leaflet invites. You can insert the right leaflet for the right function to the right guest. Confused? Alternatively, you can invite some guests who are not super close, to the pre wedding functions and skip inviting them to the wedding and reception. The folks from the old job might qualify in this category. It’s important to convey to the guests why you’re having a low key pre-wedding festivity or wedding ceremony and politely invite them for the reception. Sharmaji ka beta invited us for his wedding. I don’t even know them that well. Do we have to invite them to our wedding? Such a stuffy situation is called reciprocal entertaining. With Indian weddings being centred around ‘entertainment, entertainment and entertainment’ there seems to be no escaping such a scene. Let’s give you a simple way out of this. And this is general advice, not restricted to Sharmaji ka beta. If you’ve attended a recent wedding and know the person really well, they easily squeeze in to your wedding guest list. But if you’re having an intimate wedding, then a person who may not be super close can be stricken off. To avoid an awkward situation, let your mutual friends/family members know who’s being invited and who’s not. A random gift just showed up at my door congratulating me for my engagement from someone we haven’t considered inviting for our wedding. Do they make it to our wedding guest list too? No, they don’t. What lengths people go through for a wedding invite! Their effort of sending out a gift visibly states that they care for you. Somewhere sneakily they might be anticipating a wedding invite. In a situation like this, first try to find out who this individual is close to. If it’s your dad’s laughter club buddy, get advice from dad whether or not you should invite him to your wedding. If sending out an invite to him means inviting all the other members of his laughter club then you definitely will be struggling to laugh hard at your wedding. But this one requires some sensitively. Do we allow wedding plus ones? If your friend has been dating this girl/guy just for a year or less– Not invited. Couples with whom either of you are not good friends with – Not Invited. If the couple has publicly declared their engagement or marriage announcement – Invited. 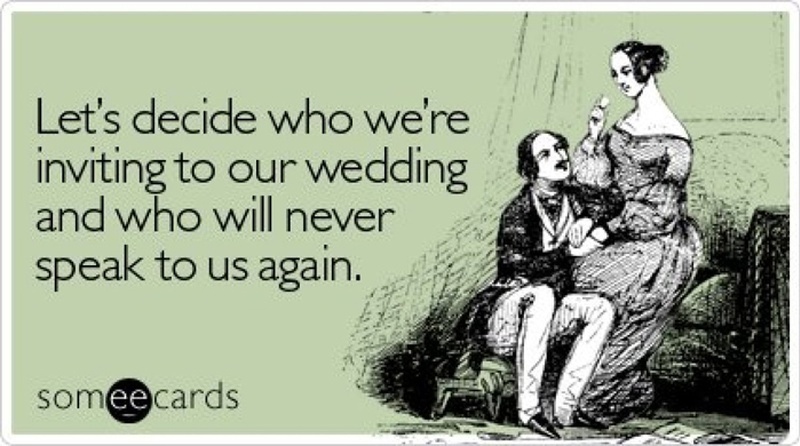 The situation can be tricky, but its best to prepare your friends for the idea of why their plus ones, can or cannot make it to the wedding. Express your concern that the numbers to the event are limited. They are your best pals, so don’t even think for a second that they will feel offended and take this invite thing too personally. Family friends were invited for Pooja didi’s wedding. But all they did during the celebration was behave overtly rude, complain about the arrangements, crib about the food being not so yummy and criticize every little element. Can we not invite them for my wedding? You would expect us to say ‘No, don’t invite them’ – right?! We think otherwise. Not inviting such negative naggers is only going to make things worse. You invite them and handle them calmly with responses that don’t hurt you neither offend them. For instance, if they crib about the sad music selection you have at your sangeet, respond to them politely saying this is the latest hit sangeet song and encourage them to shake a leg or two. This way they don’t get the desired response of ruining your mood and will eventually give up on being so fussy. I’m friends with all my co-workers, will it be considered rude if I invite just a few and not all to my wedding? Don’t mention you are getting hitched at your office or any other extra-curricular activity group you attend. If you do, don’t discuss your wedding plans openly. If you do, discuss general wedding planning topics without divulging details of your own. Keep chanting the mantra ‘it’s a small wedding’ to any and every one anticipating a wedding invite. Invite only the ones whom you discuss you wedding plans in detail (that too out of office). Make sure you invite your boss/group leader/instructor whom you work closely with for political reasons. Do I include my co-worker’s spouse in the wedding guest list too? It is considered rude not to include their spouses, which leads to most of them not attending your wedding. It is a standard custom to include the spouses, but if you’re facing budget constraints reduce the number of co-workers who can make it to the wedding. At the end of it all – It’s your day! Who makes it to the guest list or not is the last things that should bother you on your special occasion. Celebrate the big day with people whose presence will make a great difference at your wedding. The rest are just optional.